Last weekend I held a children’s party at my home provided by Baking Mad. 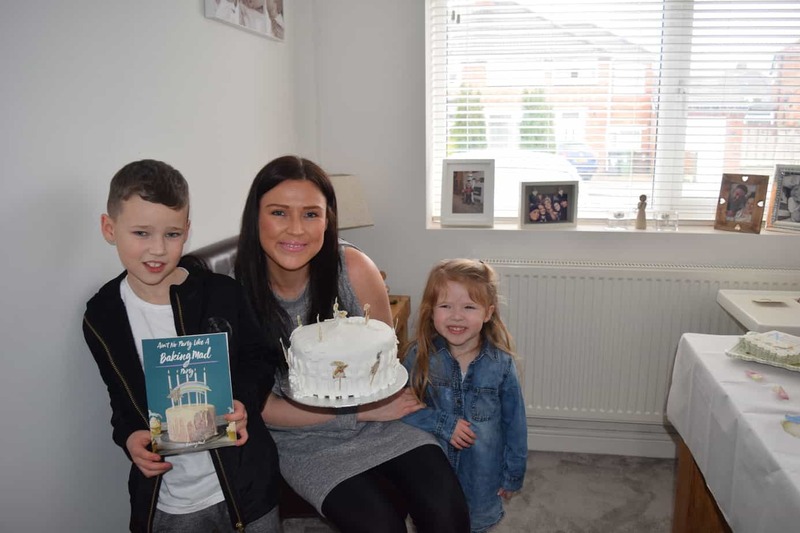 I know, I must be mad right having a load of excited kids in my home, baking a cake, blowing balloons, buttering ham and cheese rolls…when it wasn’t one of my children’s birthdays! 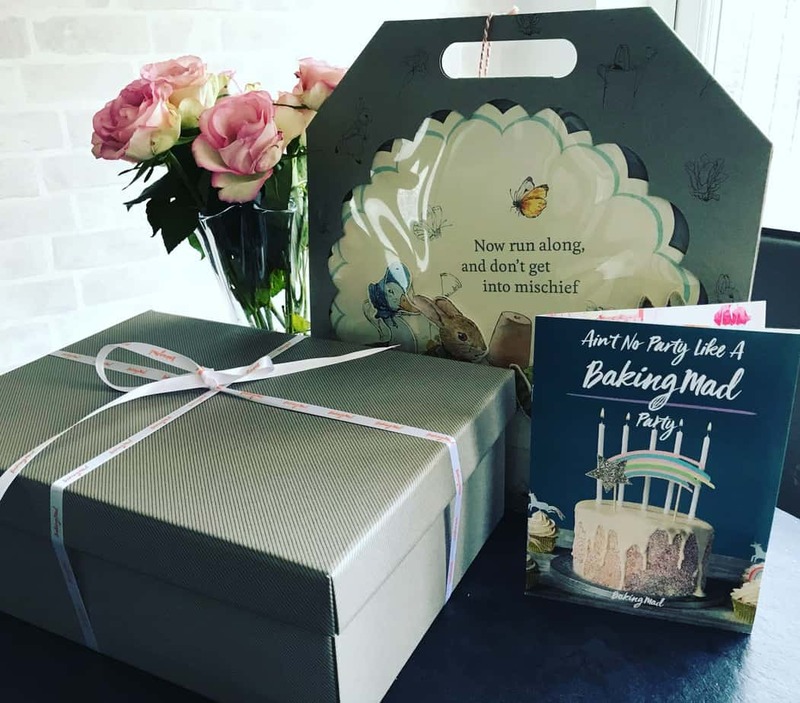 Baking Mad is a bakers dream – the home to the best recipes, a hub for bakers to share their ideas and inspirations and a place to showcase the tricks of the trade. Whatever design you go for, each cake kit contains the correct amount of ingredients for you to bake the particular design of cake plus 12 cupcakes – included in my cake kit was flour, sugar, vanilla essence, icing sugar, fondant icing, a selection of cake cutters, silver cake board, 24 cake toppers, cupcake cases and a receipt and instruction booklet. All I had to provide was the cake tins, eggs and butter. I have to say the ingredients were top quality and even when eating the uncooked cake mixture (got to be done right?!) it tasted divine! Capturing the kids getting stuck in! The whole process of baking both the cake and the cupcakes took a good fours hours (a little longer than the instruction booklet stated!) and I had to purchase more icing sugar to ensure I had enough for decorating the cupcakes. As you can see from the photos below it was a three layered cake with butter cream sandwiched between the layers and then fondant icing layered over the top. I had a fantastic fencing cutter too which was surprisingly easy to use as well as the flower cutters! Baking Mad also provided several other items to suit your theme at an extra cost. I received a beautiful and easy to assemble cake stand, plates, napkins, party bags and invitations. The quality of these items are top-notch and are beautifully decorated. The cake stand was extremely sturdy to hold the weight of the cake (it was pretty heavy!) and my party guests all commented on the quality of the card and paper that was used for these products. The children all thought the design was super cute too! My Mama friends and all their children couldn’t wait to try the cake! I was surprised to see how well the cake held being three layers and when I cut into it, the cake was set well with the right amount of butter cream sandwiched between. 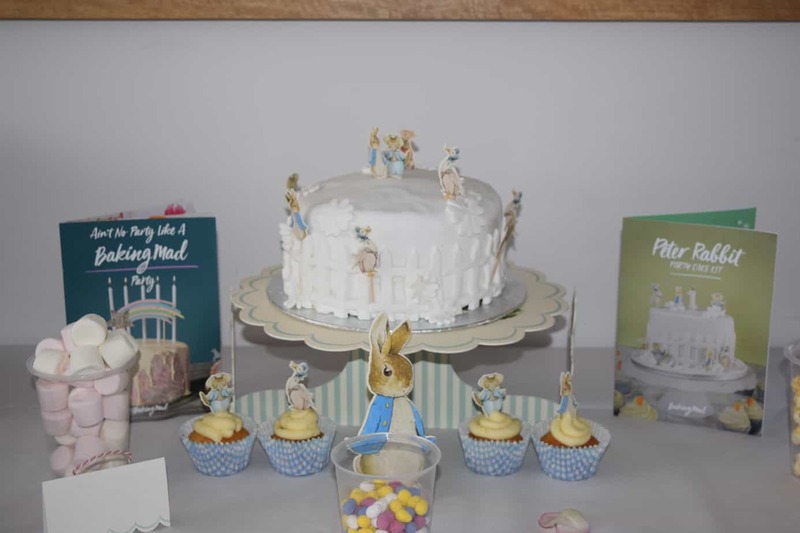 All the Mama’s really enjoyed the cake as well as the children and I sent home each child with a Peter Rabbit cupcake to take home! I have many texts after to say it was thoroughly enjoyed! 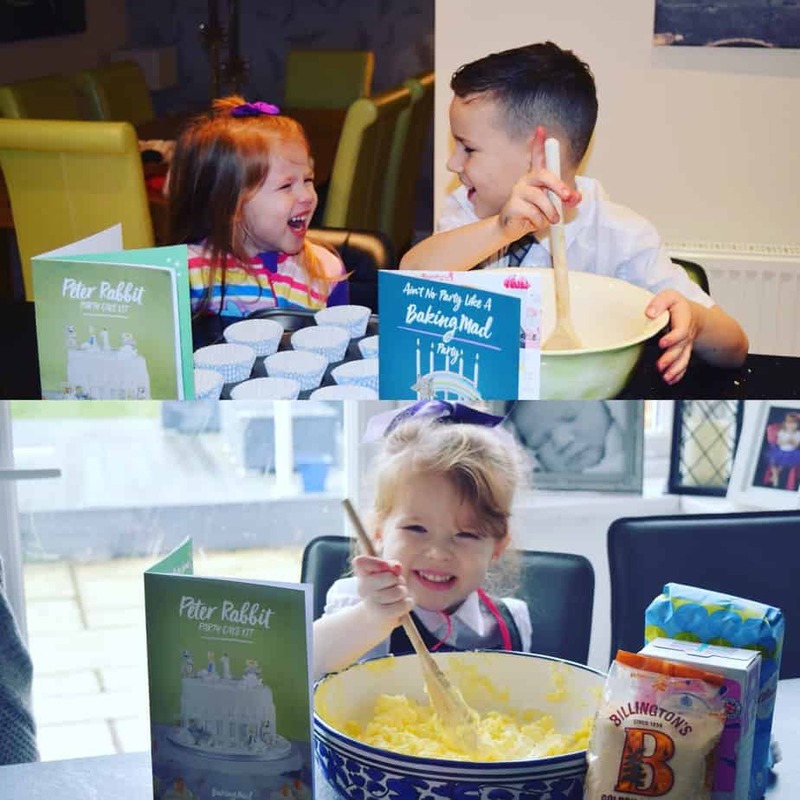 Having a party cake kit brings with it convenience and also allows you as a parent to bake a cake without the faff of having to purchase all the ingredients separately, especially when it comes to seeking out the right cutters, toppers and all the matching party supplies. Yes, I must admit it is super easy to go out to your local supermarket and purchase a cake but if your feeling adventurous and want to attempt to bake a show stopper cake yourself, then I would recommend checking out their website and viewing their different party ranges. 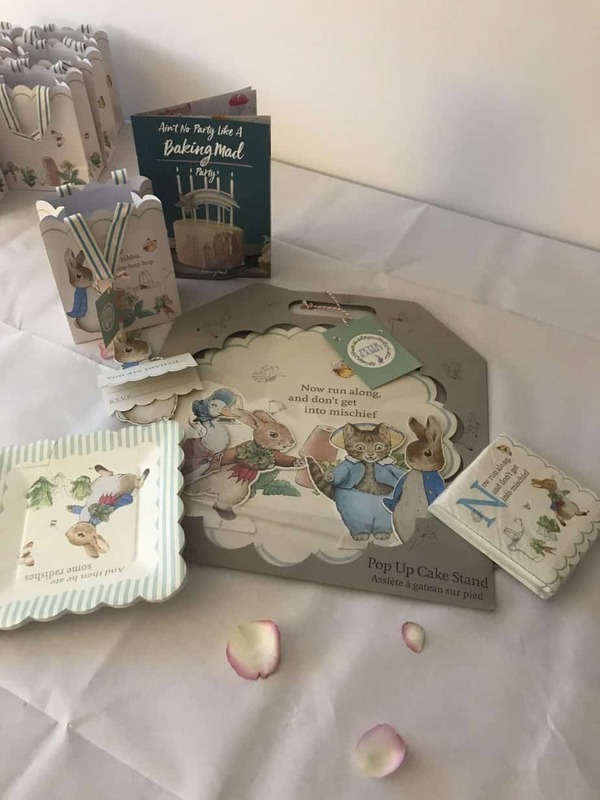 The cake kit standard price is at £44.99 with the party supplies being an extra cost but totally worth it if you love having your theme throughout. 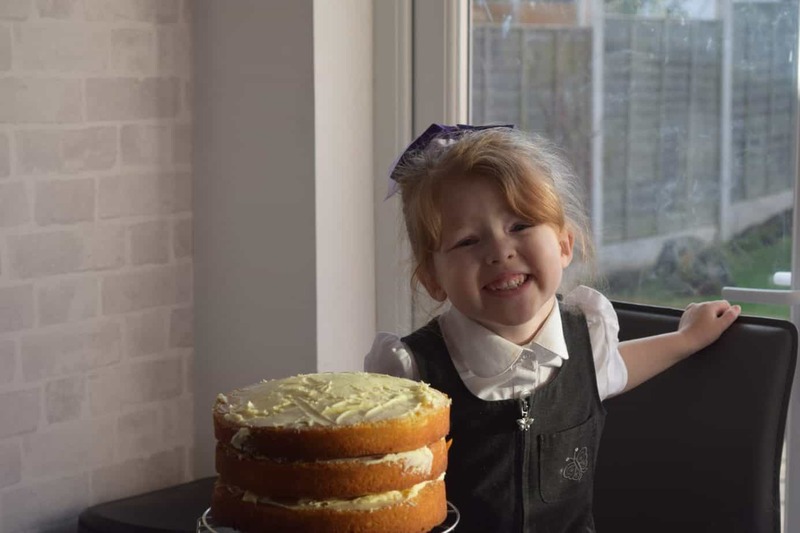 I want to say a big thank to Baking Mad for our party kit – we had lots of fun creating our show stopper cake and using the fantastic supplies for our party. If anyone is interested in checking out their products then please click here. "My Top 5 Christmas Presents 2017"
"My Breastfeeding Tips and Advice"
Oh my this is just the cutest! What an amazing idea, my daughter would have loved this for her birthday party. Wow!!! The cake looks amazing!! Watch our Mary Berry 🙂 I love the Peter Rabbit themed party as well! Well done! I have a big Peter Rabbit fan who would love this cake. What a great idea for parents who want to make a cake for their child, but are worried they will have the skill. Oh wow! Will have to have a look at this for James birthday! This looks incredible! And now I really, really want some of those cakes haha. What a brilliant and fun idea for a party. The cake looks delicious! Cake looks awesome – I be the kids went mad. What a fab idea. The children look like they really enjoyed it too! Thanks for sharing at #TriumphantTales, hope to see you again tomorrow.